Do you ever have a worry that won't go away? What is a worry anyway? This book addresses common childhood worries - a bully, a first day at school, a monster under the bed - and a host of not-so-common worries with a humorous use of creative problem-solving that helps children deal with a universal issue in a new way. Is A Worry Worrying You? is a picturebook for children that combines whimsical artwork with honest and practical advice for dealing with worries - from everyday worries about bullies and the first day of school to not-so-common worries such as a rhino wandering the neighborhood! A "Worry" is depicted as a big blue monster with no manners, that stays like an uninvited guest - but only as long as one lets it. Is A Worry Worrying You? shows young people means of dealing with worries, from confronting it directly or working on whatever is worrying one, to focusing on happy thoughts, engaging in activities like playing with cards or baking a cake, or talking with friends. Highly recommended. I am a first grade teacher who had the opportunity to read this book to my class. All of the children enjoyed the story. They loved looking for the Worry. Most importantly, this book generated a lot of discussion about things that worried them and how they could make their worries go away or find alternative solutions. I highly recommend this book for children of all ages. The clever text and delightful illustrations of Is a Worry Worrying You? speak directly and honestly to the audience. They let the reader know that there are ways to deal with worries, that there are solutions to problems and that we are not alone, all the while keeping it light and enjoyable. I read this book to my fifth grade students and they truly enjoyed it. I also shared it with our guidance counselor. Is A Worry Worrying You? is entertaining, educational and visually astounding! 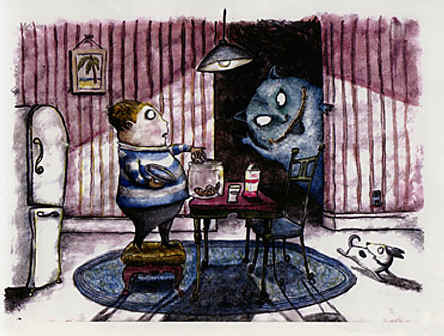 The worry monster is a brilliant representation of this sometimes very scary problem children face. The clever writing and phenomenal illustrations make this book an instant favorite.